Sharlung Dolkar dishes up bhatsa marku. When Sharlung Dolkar returned to her native Tibet in 2016, she hadn’t seen her family in 31 years. She and her teenage daughter, Tenzin Sharlung, journeyed from Malden to the Gyama Township of Maizhokunggar County, where her 83-year-old father waited. On the day of their arrival, he stood outside his home and lit incense in anticipation of his reunion with his daughter and of meeting his granddaughter for the first time. When the travelers arrived in their family’s village, Dolkar’s father was upset. Tourists to the region are heavily surveilled and the process of completing extensive paperwork, submitting itineraries, and checking-in with various Chinese officials had delayed them several hours. The sun had already set. The old man, whose eyesight had been failing for some time, was frustrated when the darkness obscured the faces he’d waited so many years to see. As Dolkar tells her story — which includes her fleeing Tibet for India in pursuit of education, a brief imprisonment by the Chinese government, and 15 years studying Buddhism under revered practitioners, including the Dalai Lama at public teachings — we’re sitting at her high-top kitchen table. Tenzin, now an 11th-grade student at the Phillips Academy in Andover, translates when Dolkar feels she can’t access the English words to articulate her experience. Her husband, a younger daughter, and her niece and nephew (also refugees, and whom she calls her children) wander in and out. They take turns joining us at the table, listening as they scoop small bowls of bhatsa marku — a traditional Tibetan dish that resembles a sweet macaroni-and-cheese. For the Tibetan New Year, called Losar, which starts on Feb. 5 and is celebrated for three days, Dolkar will make khapse, dough that has been braided or twisted and deep-fried. Her family will eat the small pastries alongside New Year’s staples like drothuk (a savory porridge) and droma dresi (sweet rice with nuts, raisins, and a tiny root that tastes similar to sweet potato). For breakfast, she’ll make changkol, which incorporates the khapse. The standard recipe begins with melted butter and chang, an alcoholic beverage that is made from fermented barley, millet, or rice. Sugar, water, and the pastries are added and gently simmered until heated through. Dolkar recalls being a child, when her mother would stay up all night on the evening before Losar, to clean their small house in preparation for the new beginning. Since the Chinese government had banned Losar decorations, many Tibetans would create a sense of festiveness by using a paste of barley flour, called tsampa, to imprint designs on the wooden beams and ceilings of their homes. “My mom used her fingers to make the pattern,” says Dolkar, her dark eyes glistening. “It was the most beautiful thing I’ve ever seen.” On New Year’s Day, her mother would leave at dawn in an attempt to get to the village water source before anyone else. Tradition stated that the first family to take from the spring would receive the most luck throughout the year. They’d use this auspicious water in the preparation of the year’s initial meal. A bowl of dough that will become bhatsa marku (left) and a bowl of ema datshi (right). On this morning, preparing the pasta-like dish bhatsa marku, Dolkar kneads the simple dough of flour and water. She then rolls the mass into long ropes on her cool granite countertop. She pushes up the sleeves of her purple fleece and coordinating flannel, and holding a rope of dough in her left hand, she works her right hand in a snapping motion, flicking tiny pieces into a bowl. “This is the fast way,” she says, “The traditional way looks like this,” she adds, demonstrating. She pinches off a piece of dough, presses it between her thumb and forefinger, and rolls it into the shape of a cowrie shell. The dexterity with which Dolkar forms the dumplings is borne from years of making the dish after growing up observing her mother. Raised in a family of farmers, she began tending livestock and completing other vital tasks, including basic food preparation, at the age of 8. Dairy makes up a significant part of the Tibetan diet and she and her siblings contributed to the family’s survival by milking the dri (female yaks) and helping to make yak butter and a hard cheese that gets dried and shredded or powdered. Water for the pasta has come to a boil on the stovetop. Dolkar shakes about half a teaspoon of salt into her palm and tosses it into the pot. Next, she guides the shaped dough into the hot liquid and stirs. As the pieces begin to swell, they look like small, dense gnocchi. A few minutes later, the little pillows float to the bubbling surface. “Now I miss my mom,” Dolkar says, “My mom said when they do this,” she mimes the action of rising to the top, “they are ready.” She turns off the burner, carries the pot to the sink, and tips the steaming morsels into a strainer. Returning the dumplings to their basin, she says, “In Tibet, we use a lot of butter. So much butter, it is like soup.” Her full eyebrows lift into high arcs. “Here we can’t eat so much butter, so we do less?” She looks up to gauge her audience’s reaction, then cuts about four tablespoons into the pot. She glances up again, smiles, and adds two more tablespoons. Next, she drizzles maple syrup from a large bottle from Costco, and folds the mixture to coat the dumplings. For the final ingredient, Dolkar opens a lower cupboard and retrieves a small, muslin drawstring bag. “This is cheese from my family farm,” she says, “Before I couldn’t get. But now my sister sends to me whenever I need.” It’s the same dri cheese she made as a child. Her thin upper lip almost disappears as her mouth forms a full, slightly crooked smile. It can take as little as a week for the dried cheese to travel from Tibet to the United States. Her sister sews the bags by hand, appliqueing decorative arcs of red fabric on the corners. Dolkar sprinkles about a cup of the cheese into the bowl, and folds once more. The brittle threads don’t fully melt when mixed with the warm ingredients, which adds a stringy texture to the toothsome dumplings. The dairy is tangy, bordering on sour, and provides a counterpoint to the sweet maple and butter. 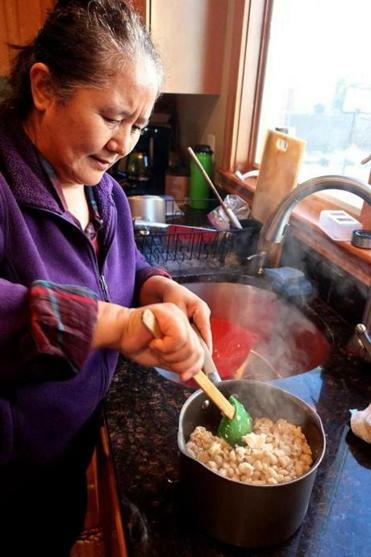 Dolkar makes the Tibetan staple every Wednesday when her family abstains from eating meat to honor the Dalai Lama; the day is considered auspicious for those born in the Tibetan astrological Year of the Boar, as he was. (While Dolkar and her daughters are vegetarian, her husband, niece, and nephews are not.) Today everyone is sharing the comfort food for lunch, as is common in Tibet. Usually Dolkar makes bhatsa marku for dinner, with vegetable accompaniments. She encourages her children to add ema datshi, a saute of hot chiles (she uses jalapenos), tomato, onion, and garlic, that gets mixed with cheese. Normally, the cheese would be ripe and pungent, similar to Roquefort, but today she uses what she calls “regular” cheese (it tastes like Monterey Jack). Sharlung Dolkar shakes some tsampa into a bowl of hot tea and butter, and adds sugar and a few pinches of dri cheese. ‘Mom teaches us everything, right?’ she says. Though she spoons the piquant medley onto her steamy bhatsa marku as if the two are a natural pair, ema datshi is actually Bhutanese. Dolkar first encountered it in Dharamsala, India, where it is popular among Tibetan immigrants who — like Dolkar and her husband — had fled a repressive regime that had outlawed the study of the written Tibetan language. She uses her chopsticks to add a few pieces of kimchi to her bowl, but her children wave off the Korean cabbage condiment. It reminds Dolkar of a fermented turnip she used to eat in Tibet. As she reminisces, her energy builds. As she begins to work the ingredients with her fingertips, in a motion that looks like a spider’s dancing legs, she explains the centrality of tsampa to Tibetan identity: “We call Tibetan people, ‘People Who Eat Tsampa.’ We eat so much tsampa! Every day, I eat tsampa.” She’s as gleeful as a child; her apple cheeks give the impression she’s much younger than her 53 years. Her husband, Sharlung Tenphel, chimes in, “I am not Tibetan.” A mischievous grin grows on his face. “I don’t eat tsampa!” He laughs. In 1957, the Tibet Mirror — an India-based magazine that advocated for Tibetan independence — viewed tsampa consumption as such a distinctly Tibetan characteristic that they invoked the word in an attempt to unite people across the diaspora. They published a letter addressed to “all tsampa eaters,” encouraging them to rise up against the People’s Republic of China by joining what would become the 1959 Tibetan Rebellion. For the Mirror, tsampa held the power to unify Tibetans from various regions and who spoke different dialects. The flour’s uses went beyond nourishment. Dolkar takes a portion of the incorporated tsampa mixture into her hands, molds it into a rough log, and hands it to me. “Pa,” she calls the finished product. The word can refer to either small cakes or rolls, like Sharlung forms, which maintain the impressions of the preparer’s hands. The overall effect is toasty and satisfying. It’s basic — protein, fat, carbohydrate — and oriented to sustain, requiring little in the way of equipment and utilizing the elements on hand. Many Tibetans carry pouches of tsampa with them to be blended with hot liquid at a moment’s notice. For Dolkar, eating tsampa is now a choice that results from a longing more than a practical need. She couldn’t go because she was undocumented and unable to leave the United States. She was naturalized as a US citizen in 2013, taking a new name to obscure her identity from China, which might recognize her as an illegal escapee should she return. It took three more years — and her elderly father kneeling before a tourism official in Tibet — to get her travel visa approved. On the night Dolkar returned to her village, she went into the old wooden structure where she had grown up. In recent years, her family had moved to a Chinese-commissioned modern house, leaving their traditional Tibetan home. Inside, Dolkar looked up and wept at the sight of her mother’s flour decorations, still intact on the branches that comprise the ceiling. In the photo she shares, the dots look like little white moths that have petrified to ash in a beautiful pattern. Her mother had dipped a thumb in tsampa and pressed it onto the wood, over and over, until meaning was made. Michelle-Marie Gilkeson can be reached at michelle.marie.gilkeson@gmail.com.